Home / Posts tagged soup"
While it has been years since I have heard this, I have never forgotten these words. Initially, I chalked it up to the rants of a crazy old Creole lady, but over the years this saying has proven to be fantastic words to live by. Actually, it has become one of my favorite little quips that I like to whisper to myself whenever I start getting heated about something not working out the way I wanted or expected. It is a great exercise for a control freak like me. The thought process goes a little like this: Missed my flight – oh well it was probably going to go down in a ball of flames anyways. Hit crazy traffic on the way home after a hellacious day – that just gives me more time to sing obnoxiously to myself in the car. My kids recently brought home a similar little rendition to this saying that they learned in school. “You get what you get and you don’t throw a fit!” Pretty darned smart if you ask me. They seem to like this better than when I sing the Rolling Stones “You can’ always get what you want!” to them. At face value all of these sayings are some pretty simple words, but I have found that accepting something less than desirable is a pretty tough lesson to learn. I am reminded of this every time I go through the drive through and order something sans cheese only to find out later at home they screwed up the order. While I open up the hamburger and see that cheese has melted in to the whole thing my blood pressure rises and I start to murmur out loud, “How fricken hard can it be too…” and then I cut myself off, “…simmer down now, it’s just a hamburger.” Oh well probably didn’t need that 2000 calorie guacamole bacon burger anyway. I am finding this lesson of acceptance is also very, very difficult to teach. As I write this I realize this is the control freak in me coming out. The thing is though, like most parents, I don’t want my children to have to go through the hardships in life that I did to learn the true value of these words. I want Barney to teach them. I am starting to wonder though if the sad truth is, figuratively of course, that it takes a small burn to learn not to touch the stove. Case in point – I was reading an amazing book a couple weeks ago, “Kidjacked: A Father’s Story by Scott Lesnick, a true story about how the author fiercely battled to get his children back from an ex-wife that kidnapped their children and took them to Israel. Like any good memoir would, he discusses his life in general to give the reader all the background info, and in doing so, he describes how he developed a successful sales career. It wasn’t something he studied for or some fancy seminar he attended; instead, sadly, it was that his Mom beat the tar out of him good and often when he was young so he learned early on how to read people and situations for survivals sake. Talk about turning a frown upside down, the guy built a successful career out of avoiding child abuse. So in keeping with the theme of delays & disappointments and in honor of the crazy old Creole lady who blessed me with the full understanding of this saying, I am finally getting around to posting this New Years recipe – Hopping John by Kalen. I have been meaning to post this since January, but life, kids, and the general chaos have taken priority. All of which have been fantastic delays and disappointments that I am very grateful for. I have been making this recipe now for the past three years making a few changes here and there. What doesn’t change is the most important part and that is being sure you get your required allotment of black-eyed peas for good luck – a Creole tradition. Delays and disappointments are great for character building, but a little luck never hurts either! A couple of notes first: If you can not find the black-eyed peas in southern sauce, you can make them the old-fashioned way, but this adds a bunch of time. Follow the directions on a package of whole black eyed peas, but add in additional flavor by adding more of the same ingredients as above, i.e. celery onions, bay leaves, paprika, cayenne, salt and pepper while they are simmering. Also, the below method is in order to get a clean looking broth, this is why it is two steps; however, you can get pretty much the same flavor in half the time by just doing everything in one step. It just ain’t as pretty. 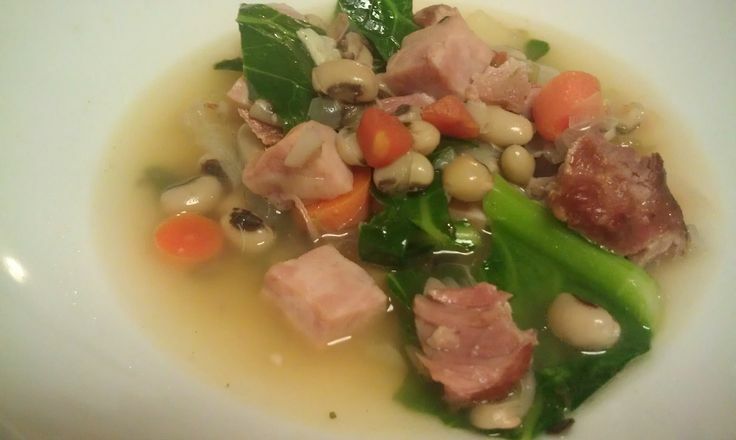 Brown the ham hocks on all sides in a soup pot about 5-10 minutes. Add half of the carrots, celery onion, and garlic – all can be rough chopped. Saute 3 minutes stirring so the garlic doesn’t burn. Add chicken stock and water – should cover the hamhocks. Add 2 sprigs thyme, 1 sprig rosemary, and 2 bay leaves – just throw them in, no need to chop it. Add a dash of crushed pepper. Let simmer for 2 hours or until the ham hocks are falling apart. Remove ham hocks and pull off meat when cool enough to handle. Discard all the fat/bones. Drain the pot reserving all the liquid and discarding all the veggies/spices. Return liquid to the pot. If it is especially oily, you can skim the top off. Put the ham hock meat into the liquid. For the remaining veggies- dice the onions, slice the carrots and celery, crush the garlic and add all to the pot of broth. For the remaining herbs, finely chop the leaves and add to pot. Add the black-eyed peas and the collard greens to the pot. Simmer for 20 minutes or until the veggies are done.